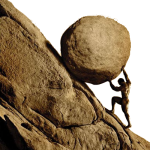 This is my first follow-up post to The Belief Matrix, in which I attempted to advance a universal model for civilizational responses to subsistence crises (The Malthusian Loop) and the Western challenge (The Sisyphean Loop). 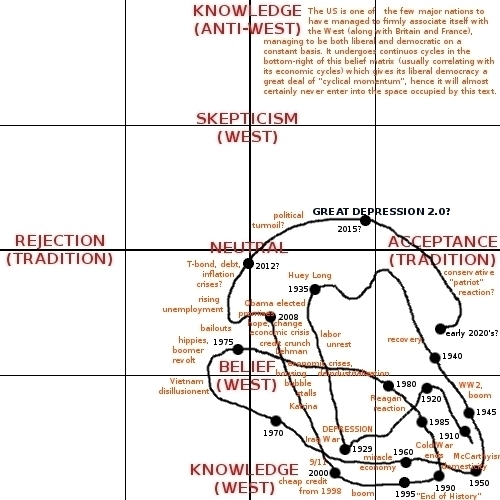 The first country I’ll apply this too is the US, because doing so will allow me to make several important points about the nature of the belief matrix – namely, that even nominally “Western nations” like the US – that archetype of the West – is imprisoned within the Sisyphean loop. This is because the Idea of the West, as previously defined, is a rationalist absolute, whereas all other human societies are not. Hence the US can never attain full union with it, but only try to. Instead, decade by decade and century by century, it redefines liberty. This is a mostly consensual social activity that rarely veers into large-scale violence, the Civil War being the most vivid exception (though even it was an extraordinarily civilized affair by the standards of the time). This process is so internalized that Americans, along with the British or the French, think of themselves, and define themselves, as “Westerners” with no apparent conflict between it and their national identities. To the contrary, they are complementary. 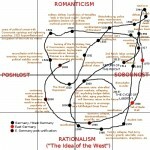 Through the accumulated circular momentum of liberal tradition, the structure of its political system which moderates sharp swings towards extremism in the population and of the media which muffles extremist voices, and most importantly its reconciliation of liberalism with popular democracy, America’s “liberty loops” manage to remain anchored firmly within the bottom-right quadrant, well away from the instability brought on by the disillusionment / rejection of tradition of the left, and the totalitarianism of the top. But what makes the US a spiritually much more satisfied nation is that the very organic nature of the integration of its sobornost and Westernism makes Americans unaware that they live in the Belief Matrix, just like everyone else. Below is the belief matrix for the US during the past century. At the beginning of the century, America was an open, self-confident, emerging Great Power, with a rapidly growing economy and population. Though after the end of the First World War there was widespread concern over Bolshevism, European entanglements, and immigration, this did not significantly lower its belief in itself. This changed substantially in the 1920’s, which saw a significant retreat from tradition: a) female suffrage from 1920, b) the first great consumer revolution, including mass automobile production and chain stores, c) the rise of crime and homicide rates, linked in part to Prohibition. The US started drifting left. This drift accelerated during the early 1930’s in the time of the Great Depression, when a) economic output collapsed by around 25%, causing mass unemployment, b) homicide rates peaked at over 9.0 / 100,000 during 1931-34, c) the American fertility rate fell to a nadir close to the replacement-level rate of 2.1 children per woman during the 1930’s, d) numerous incidents of labor unrest, and e) the federal government came to face significant challenges from the right and the left (e.g. Huey Long with his “Every Man a King” socialism) – though at no time was it really threatened, which testifies to the stability and dynamic inertia of its liberal democratic tradition. From the late 1930’s, the economy began to recover and criminality declined. The US began to recover faith in itself and its mission after the uncertainties about the future of liberalism and capitalism prevalent in the 1930’s. This was reinforced by victory in World War Two and the massive economic, political and spiritual boost it imparted to the US, which emerged as a global hegemon, far stronger than the USSR. Despite the McCarthy witch-hunts and the launching of the military-industrial complex as a permanent feature of American society, the 1950’s and 1960’s retain a reputation of being a Golden Age of US history. Morale was high due to visible US superiority – despite occasional shocks such as the Soviet testing of a nuclear bomb in 1949, the (false) fears of a “missile gap” in the mid-1950’s and the Sputnik shock of 1957. The period saw an unprecedentedly low level of income inequality and the massive economic growth that caused the post-war to 1973 period to become known as the “miracle years”. Homicide rates remained at around 5.0 / 100,000 (a relative low by US historical standards) until the late 1960’s and a spirit of confident, middle-class domesticity contributed to a baby boom that resulted in US fertility rates lasting through to the early 1970’s, by which time it had begun to drop precipitously, along with the rest of the industrialized world. Meanwhile, belief in the validity of the Idea of the West remained extremely firm – so firm, in fact, that anti-Communist feelings manifested themselves into overt persecution in contravention of the Idea of the West (with its emphasis on rule of law). This is the Law of Circularity in action (from the Belief Matrix) – at its extremes, ideologies converge (or flip); even as the Red Scare zealots shouted about the Communist threat to US liberties, their own actions forsook their principles – to the overwhelming approval of the American population, at least until they stumbled over into the realm of the absurd (i.e. the McCarthur-Army hearings). Though the US moon landings of 1969 seemed to mark the apogee of the American Golden Age, in reality the country was already in fast moral decline. The oil crisis. Anti-war movements. Watergate. Vietnam. Hippies. Roe vs. Wade. Culture war. Drugs. Oil crises. Limits to growth. The waxing Soviet menace (they achieved nuclear parity and conventional superiority in Europe by the mid-1970’s). Rapid fertility decline. The rising economic challenge from Japan and Germany, and the beginning of deindustrialization in the Mid-West. During this period the country moved sharply left, away from tradition and belief in itself; yet as always, the socio-cultural liberalization of the 1970’s was the author of its own demise, spelled out in this case by the Reagan reaction – a peculiar mix of economic deregulation, hard-line foreign policy and social conservatism. By the early 1990’s, there appeared an ostensible new dawn in the wake of the collapse of the Soviet Union. Fukuyama began proselytizing his End of History thesis, proclaiming Western liberal democracy to be the final stage of history, following a long tradition stemming from Manichaeism through Marx. This became somewhat of a pillar of Western thought. China and Russia, the two erstwhile socialist giants, were beginning to acquire new dependencies with the West. The Asian model of development seemed increasingly discredited with the collapse of Japanese growth rates in the early 1990’s, and later “confirmed” by the East Asian financial crisis of 1997. Europe was increasingly anemic and mired in social problems stemming from its aging populations and welfare states. Yet much of this progress was illusory, and it began to unravel during the Bush years. 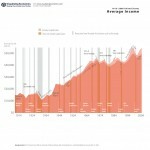 Income inequality rose to levels unseen since the Great Depression. Though crime remained at a relatively low level of around 5.0-6.0 / 100,000, this was only accomplished by imprisoning an ever greater portion of the American population. Even as car production fell from 13.0mn units in 1999 to 8.7mn units in 2008, the financial industry metastasized. The 2000’s saw a “jobless recovery” from the .com bust while median incomes stagnated (or outright declined, if the people at ShadowStats have a point). The US is coming to resemble the late USSR across a disturbingly wide spectrum of social, economic, military and cultural indicators. It has been moving away from the state of sobornost, “a deep sense of spiritual harmony amongst classes, regions, races and sexes”, since the 1970’s, i.e. 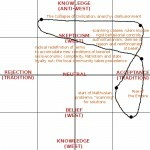 towards the left on the Belief Matrix. 9/11. Iraq. Extraordinary renditions. Guantanamo. The Katrina debacle. Housing bubble. Regulatory capture. Credit collapse. The fall of the investment banks. The rise of the “Rest” (led by China and Russia), who are hardly best friends with the “West”. The Great Recession. Deficits, debt, decline. As a result, the American population is now rapidly moving away from the firm belief in the West that characterized the 1990’s, and even further away sobornost. The election of Obama, perhaps the most liberal and outsiderish President in history, is just a reflection of these deeper trends. At an unconscious level Americans realize they have deep problems requiring radical solutions. 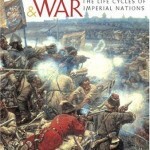 A detailed discussion of the waning superpower’s future prospects I leave for another post – suffice to say that whereas in the next decade its power will likely decline precipitously relative to China’s, its inherent geographic, economic and institutional strengths will allow it to remain a key pole of the emerging new world order, and we are likely to see a certain resurgence by the late 2010’s or early 2020’s, as soon as its current imbalances and contradictions are resolved or at least contained. Based on the dynamics of the Belief Matrix, it is likely that the US will repeat the dynamics of the Great Depression not only in economic, but in social terms. Namely, there will be a partial collapse of legitimacy in the government; the feds will face challenges from the far-left (new Huey Long’s, anarchism, etc) and the far-right (demands for more state rights, anti-tax movements, “American reactionary patriots”, etc); fertility will collapse from the current replacement-level rates, as welfare shrinks and the utility of having children for the very poor, currently the most fecund social group, drops; crime will increase, etc. Yet within a decade a new social order will gradually emerge, probably fiscally and socially conservative and more authoritarian than the current one, and with it a new equilibrium will slowly, painfully come into being. However, due to the sheer circular momentum of America’s liberty cycles, and the sheer power of the historical force behind, the country is likely to remain, at least in most respects, a liberal democracy. The same cannot be said of Russia, Turkey, or even countries like Germany or Japan. but let us never forget that US capitalism developed precisely by committing genocide against the millions of native people who inhabited this “abundant high-quality land”. True… but the West is just that… rule of law, sanctity of contract, etc. Not humanism or kindness. Some 72,000 “vagrants” (mostly peasants driven off the land by new, dispossessing elites – and this is a massive number given that the size of the English population was only around 4mn then) were hanged in Henry VIII’s England… so can we really say that “barbarous Muscovy” under “Ivan the Terrible” was that much more “tyrannous” than his English contemporary?